Since I went to Good Dog during my Meatless March adventure and had a really great veggie burger, I decided it was time to give their regular burger its final chance to impress me. My first trip in 2011 warranted a “D” rating and a revisit in 2013 upgraded that to a “D+”. 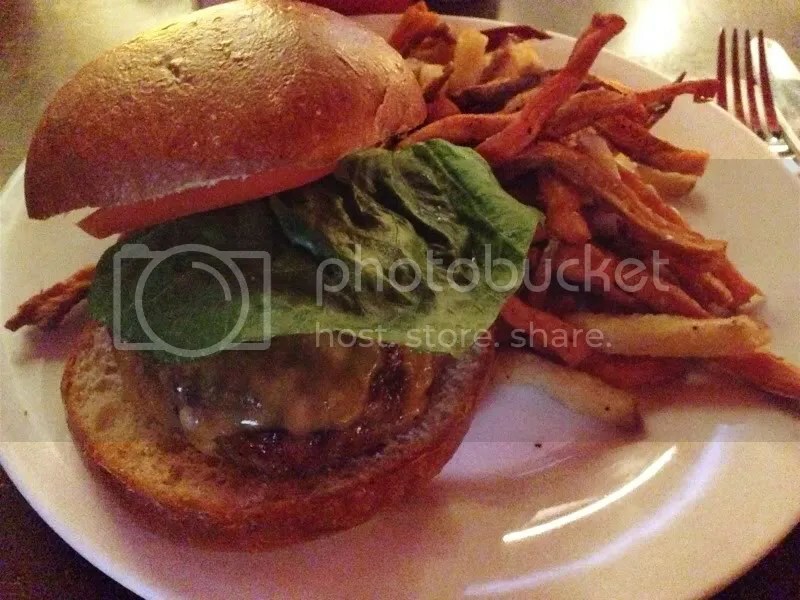 Would a year & a half between visits finally give their burger rating the boost it deserved? I ordered the burger exactly the same way – topped with cheddar cheese, medium temperature – and kept my fingers crossed until it arrived. To recap, the burger is a 1/2 lb ground sirloin patty topped with lettuce & tomato on a brioche bun. 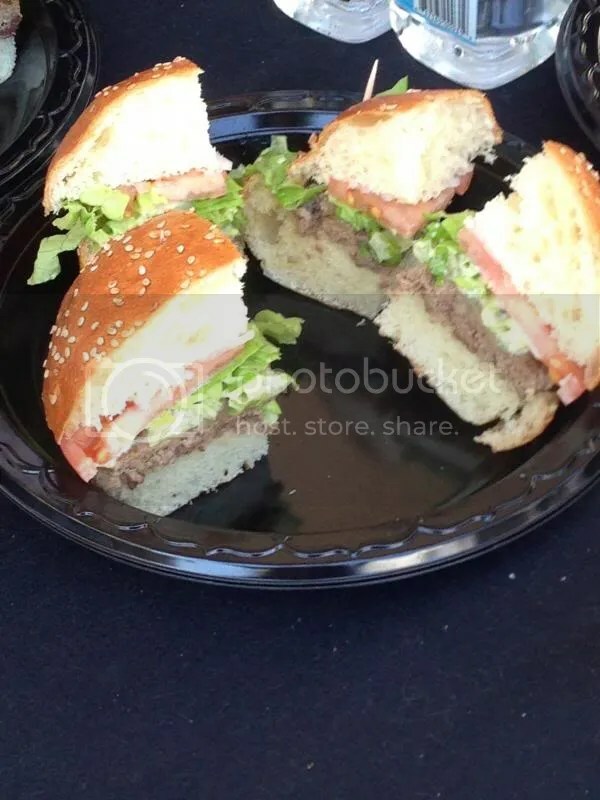 At first I was concerned because of all the empty space on the bun and the lettuce was a large, limp leaf sticking out from under the bun (which I tucked back in to take this picture). But I took one bite and a smile crept across my face: We had success! The burger was cooked perfectly to medium as requested and was nice and juicy. Once I began eating, the burger to bun ratio eventually evened itself out. It turned out to be a simple, flavorful, no frills bar burger. I was glad that I had enough confidence in it to return and try it for a third time & finally got the version of this burger that so many of my friends had bragged about as being the best in town. I’m proud to upgrade this burger’s rating from a “D+” to a “B”. Posted in bar burger, brioche, buns, burger, burgers, Center City, cheddar, cheese, good dog, Good Dog Bar, lettuce, no-frills, tomato. Bookmark the permalink. So here we are, our very last veggie burger of Meatless March. Since several of the other veggie burgers I tried this month were from places where I’d already had their regular burger, I decided I’d continue that trend and stopped by Good Dog Bar – a bold move considering that on both of my visits there, I was extremely disappointed in their basic beef burger. Could their veggie burger wow me? Or would I leave once again with my tail tucked between my legs? 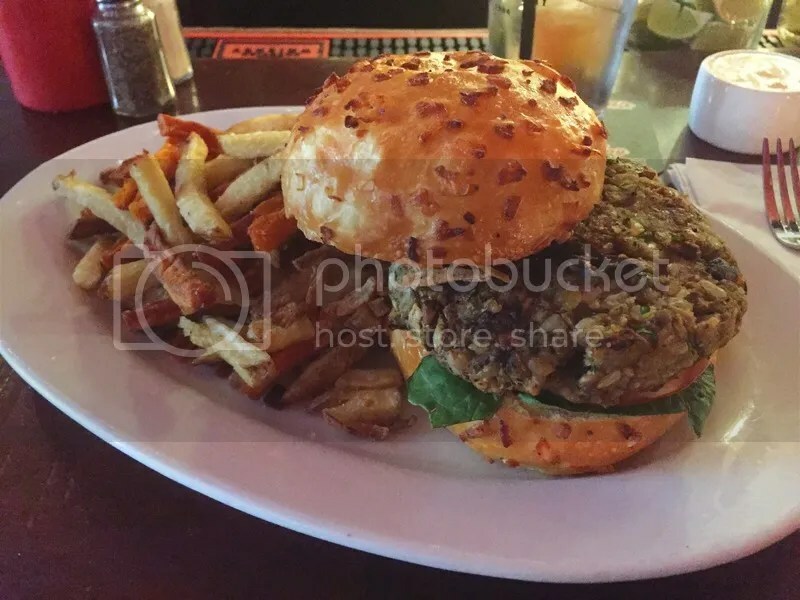 The veggie burger here is a patty of roasted eggplant, mushrooms, lentils & brown rice topped with lettuce, tomato, crispy shallots & spicy ketchup on onion brioche roll. The patty itself looked great; I love when I’m able to see all the elements together. That way I know they’re not just using some frozen fake meat. All the flavors came together really nicely and the spicy ketchup wasn’t overly spicy. I tried to put some of the accompanying fry sauce on the patty, but it made it kind of bland, cancelling out the veggie flavors. I also liked that they used an onion roll and not a boring brioche. It tasted really fresh and healthy – even if I was also chowing down on their signature kennebec & sweet potato hand-cut fries! I’m a little disappointed that their veggie burger was better than their regular burger, but that just means I’ll have to give the regular burger one last shot after all. So, which of the four veggie burgers that I ate this month stole my heart? Unlike last year, there was a clear winner – CITY TAP HOUSE! Everything about their veggie burger just clicked for me. The beets, the cheese, the multi-grain roll – it was the kind of veggie burger that makes you forget that you’re not eating meat because it’s so damn delicious. Am I about to give up on meat burgers for good for it? Definitely not! I’m already counting the minutes until April 1st so I can dive right back into some medium-cooked meat! Posted in eggplant, good dog, healthy, lentils, Meatless March, mushrooms, onion roll, shallots, veggie burgers, veggies. Bookmark the permalink. Since I gave 500 Degrees the benefit of a revisit a while back, as they were one of my first posts without pictures, I decided to do the same for Good Dog (especially since I did not have a “good” experience there the first time around). Last time I visited around lunchtime on a Friday, so this time I picked happy hour on a Thursday. Despite the draw of their namesake “Good Dog” burger (stuffed with Roquefort cheese and enjoyed by a certain mayor of Flavortown), I again opted for a regular burger topped with cheddar – as a proper revisit should have you referencing your original source material. The patty is 1/2 lb ground sirloin and it’s topped with lettuce & tomato on a brioche bun. Posted in brioche, buns, burger, burgers, cheddar, good dog, philadelphia, philly, revisit. Bookmark the permalink. 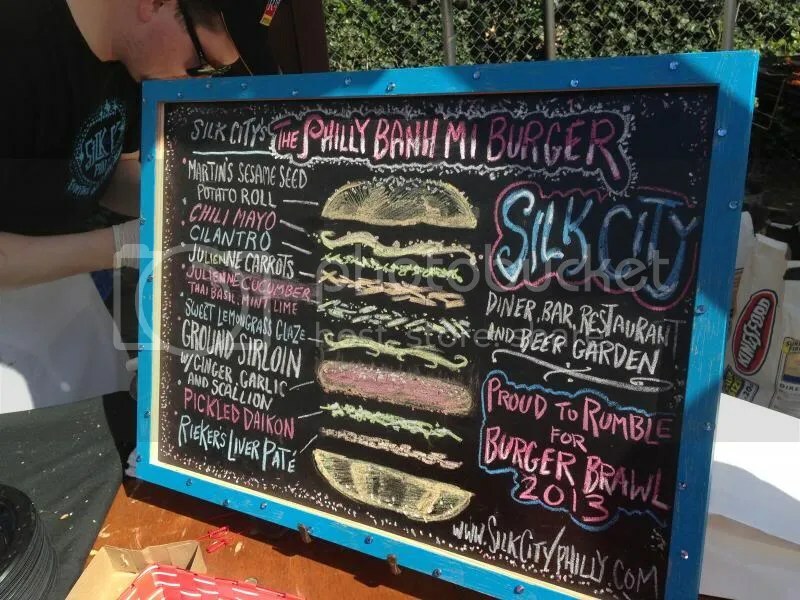 I was so upset that I had to miss the Burger Brawl last year that I made sure that I did not miss it again this year! As soon as I found out, I got my tickets and waited (impatiently), plotting all the delicious burgers I was going to enjoy. 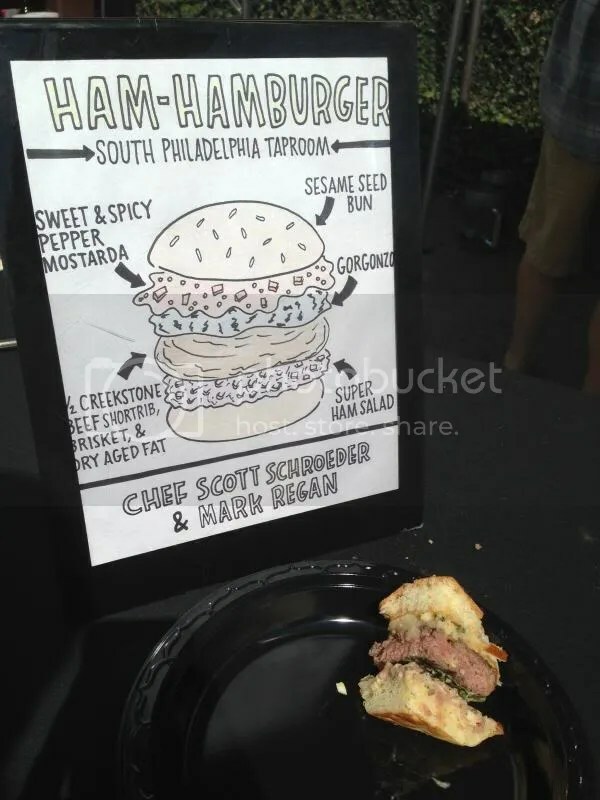 In case you’re not familiar, the Burger Brawl was started in 2011 by Restauranteur Rob Wasserman of Rouge/500 Degrees fame (who I got the pleasure of meeting by accident while taking a much needed burger time-out), and the proceeds go to support local Philadelphia-area schools by constructing new technology labs. Past winners include London Grill and Bobby Flay (which just so happen to be two of my favs). 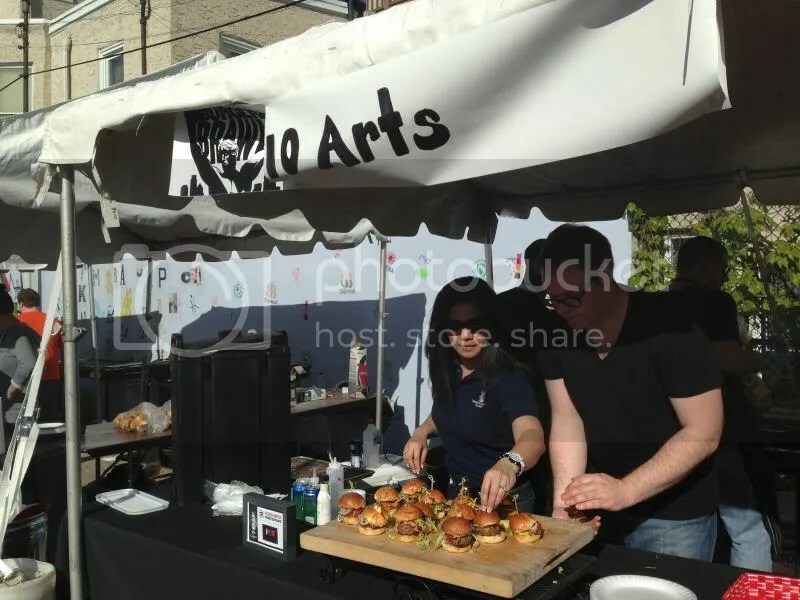 I’d already tried a handful of the competitors that were participating this year and my strategy was to cover the burger bases that I hadn’t touched on yet like Misconduct Tavern and Percy Street BBQ (whose burger topped with ham and a cured egg yolk just happened to be my favorite of the bunch). 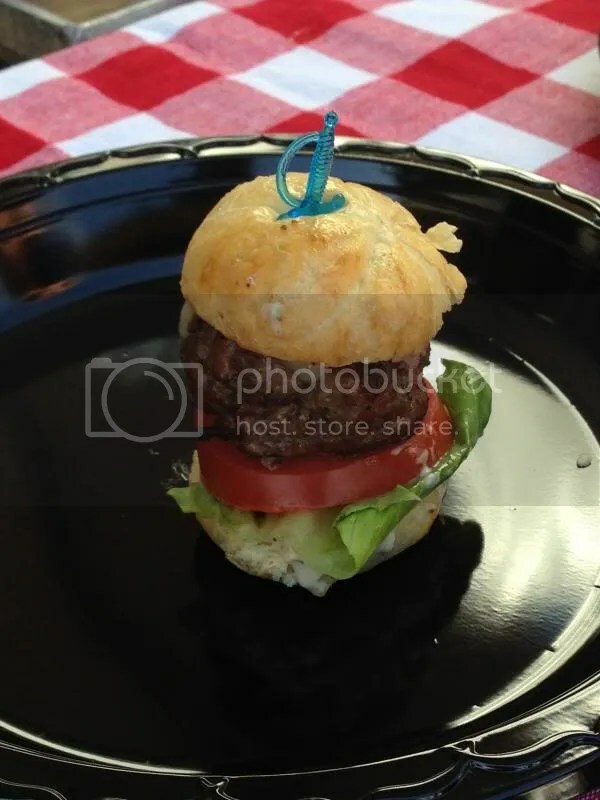 There were all kinds of burgers on display in the competition, in many different shapes and sizes. Some decided to go the “slider” (or “mini burger”, if you want to get technical) route like Rouge and 10 Arts. 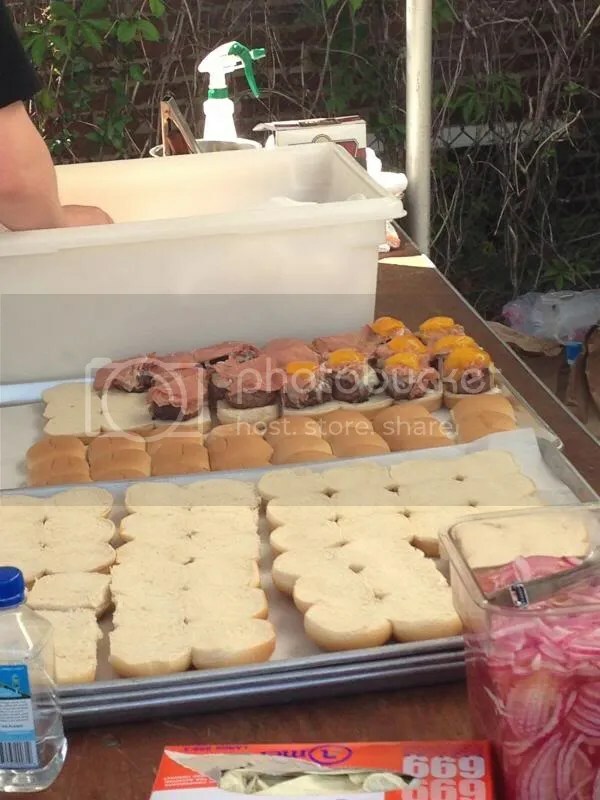 Others were grilling up full sized patties and then slicing them into halves (like Table 31) or quarters (like The Industry); a slightly better strategy and easier to get out to the masses. I made it about halfway through the burgers before I eventually gave up and decided to take a timeout for about an hour. 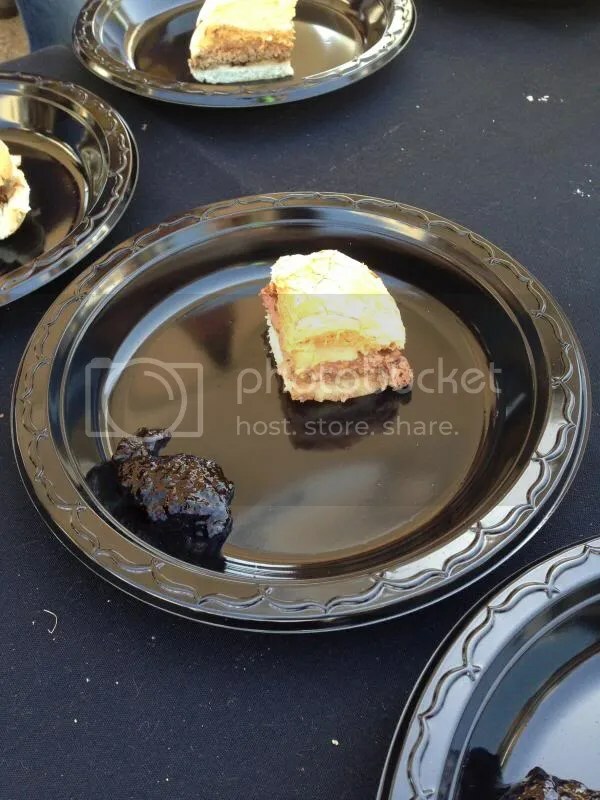 But unfortunately by the time I was ready for Round 2, most of the burger stations left were all out of meat! Luckily, I didn’t miss too many that I hadn’t already had like Alla Spina, The Dandelion and London Grill. 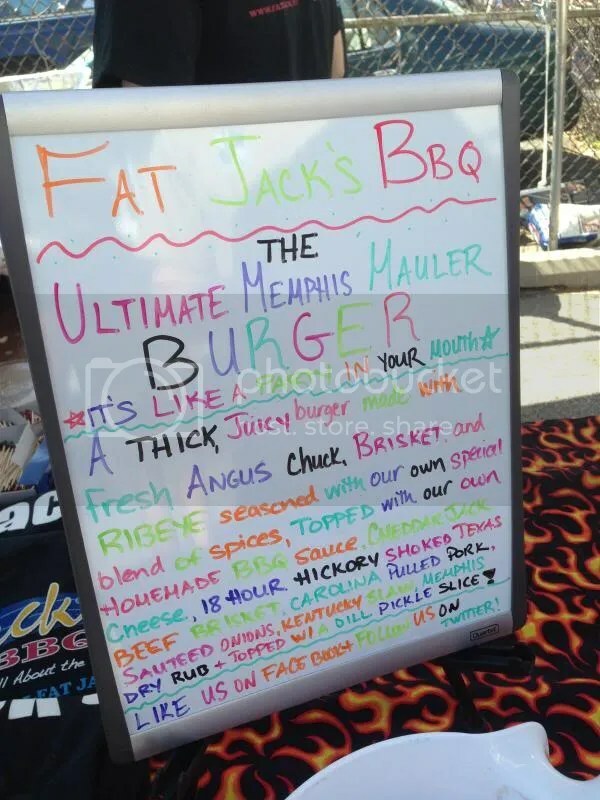 The one I was most disappointed about missing was George Sabatino’s burger (his station was near the entrance when I came in, but his grill wasn’t set up yet). 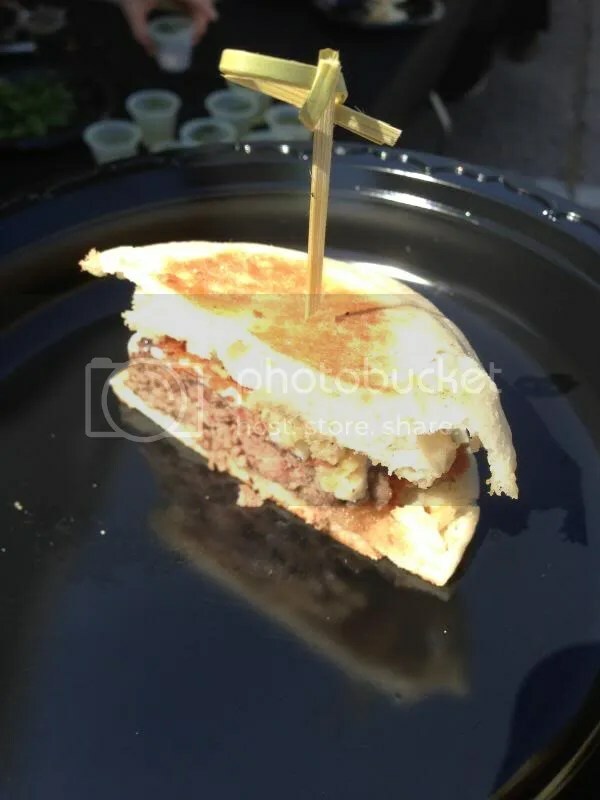 Luckily, Morgan’s Pier re-opens this Thursday, so I’ll have all summer long to try out this crazy burger that is supposed to be dipped in liquid nitrogen and deep fried! So who were the big winners? 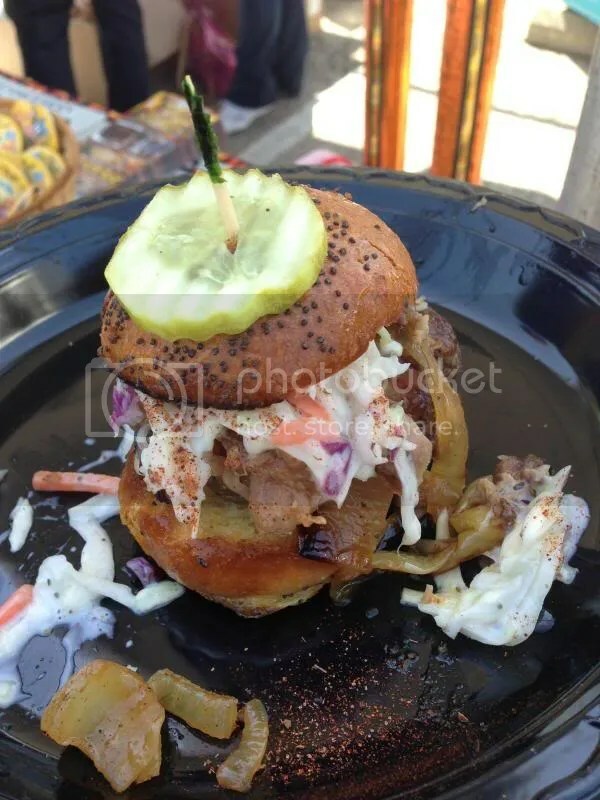 The People’s Choice award went to Lucky’s Last Chance of Manayunk for their Peanut Butter, Bacon & Jelly burger! (Nice to get some neighborhood pride going!) I know that combination of things on a burger sounds kind of scary, but it was actually really good – and I don’t even like jelly! Posted in 500 degrees, alla spina, bacon, burger, Burger Brawl, burgers, dandelion, good dog, london grill, lucky's last chance, pb&j, percy street, philadelphia, philly, Rex 1516, the corner, the industry. Bookmark the permalink. 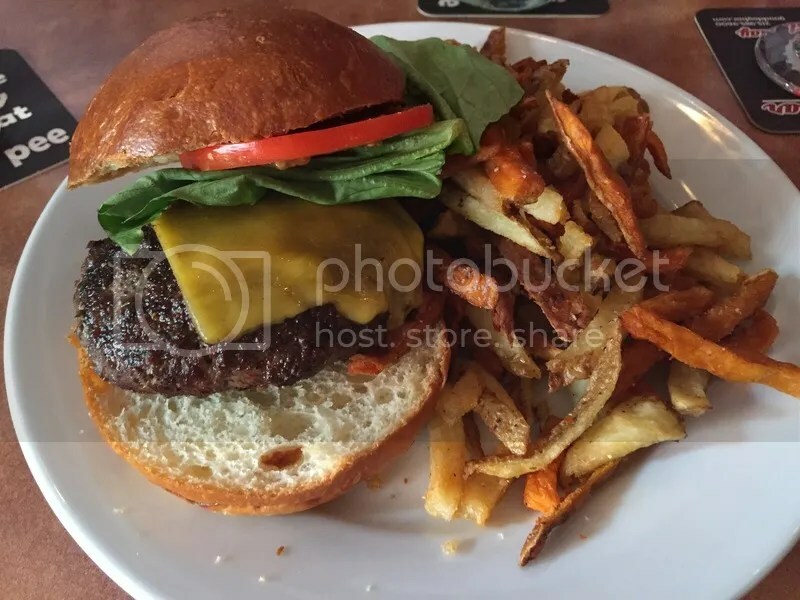 Much fanfare had been given on the Internet about the burgers at Good Dog, a bar located on 15th street between Walnut and Locust, especially in regards to their Good Dog burger which comes stuffed with Roquefort cheese. I opted for their traditional burger, prepared medium – which is how I ask for all my burgers. Medium gives you just the right amount of pink for it to be juicy, but not still mooing. I came during the lunch hour on a Friday, so it was full but not packed and I sat at the bar. And waited. And waited. When I was at the point of gnawing my arm off I was so hungry, my burger finally arrived on – SURPRISE! – a brioche bun! (But that was on the menu so I guess I already expected that. Plus, I could tell by everyone else getting served their food before me.) Their fries came with a side of their housemade aioli for dipping. It was kind of like a watery version of the onion ring sauce at Burger King. Regardless of how busy your kitchen is, the least you can do is try to prepare food to your customer’s request. I can only imagine what would have happened if I ordered a steak there (if they even serve steak; I have no clue.) Or if I had some kind of food allergy. (I actually think I did have some allergic reaction to whatever was in their aioli after I left. I’ve never known myself to have food allergies before, but my throat felt like it was closing up and made it hard to swallow.) I guess they just figured it was better to overcook my burger then undercook it, and that does not a good burger make. Bad dog, very bad dog. My rating: “D”. Posted in brioche, burgers, good dog, overcooked, philly. Bookmark the permalink.